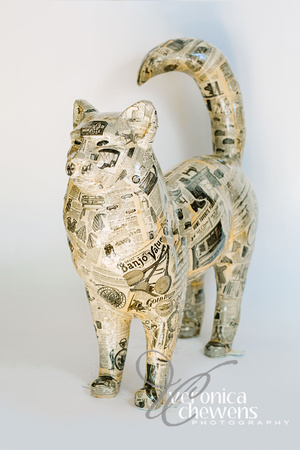 Description: Cat painted and layered with pages from various merchandise catalogs. I am a Long Island transplant, born originally upstate in Glens Falls, NY and growing up in Poughkeepsie. I went to SUNY/Oneonta majoring in Theatre Arts and that is where I met Karen, whom I have been married to for over 30 years. I moved to Long Island in the early 80’s where I worked as an Industrial Designer for 34 years. I currently operate out of my studio – FanCatStic – located in Huntington Station on the top floor of The Shops at Suite Pieces. My art is primarily focused on cats. I tend to see cats in everything. 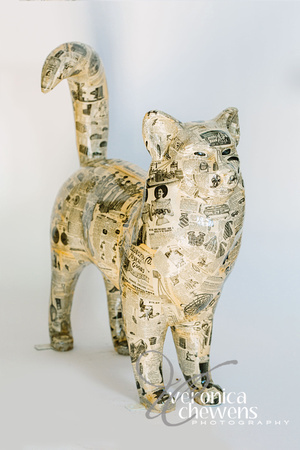 I work in all media and work with found objects to “Bring out the Cat” in them in a folksy, whimsical way. Other critters, can sometimes sneak in. 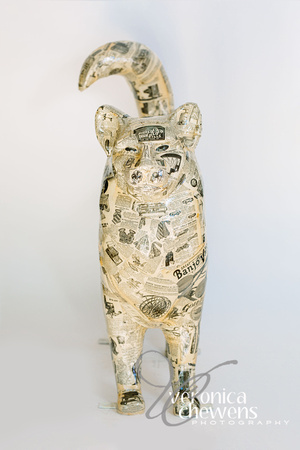 For the past four years, my larger sculptures, such as CirCat, Cat-aPult and TabbyCat, have been featured in the Public Outside Art event – Cat-N-Around Catskill (www.cat-n-around.com) in Catskill, NY, where they have received awards each year. The Cat Connection: Got first cat – a Seal Point Siamese – when 7 years old. Have had at least one cat except for two days when I moved to Long Island. Two days after setting up my apartment I adopted a Blue Persian. Moved up to two cats when I took in family Cream Persian. Expanded to three cats when we took in a stray kitten from the private airport I fly out of. Fourth came in the form of a feral cat from where I worked. Five and six are Foster cats from Superstorm Sandy, who are now permanent members of our family. Seven, eight, nine and ten (where I currently stand) are feral kittens from one of two feral colonies Karen takes care of daily. Other things to know: I collect and write children’s books (primarily featuring cats, naturally). I own and fly antique aircraft.